Maintaining crisp, clean edges around garden beds enhances the entire landscape. Edging and trimming beds provide the finishing touch after mowing, emphasizing bed lines and creating a well-manicured look. Likewise, edging sidewalks and driveways not only improves overall appearance, but prevents turf from intruding into these areas. While we often focus on aesthetics and budget when deciding how to edge garden beds, maintenance is perhaps the most important consideration. One the simplest and most cost-effective ways to maintain a garden bed is by creating a trenched edge. WORX 2-in-1 Lawn Edger and Trencher makes establishing and maintaining trenched edges a breeze. 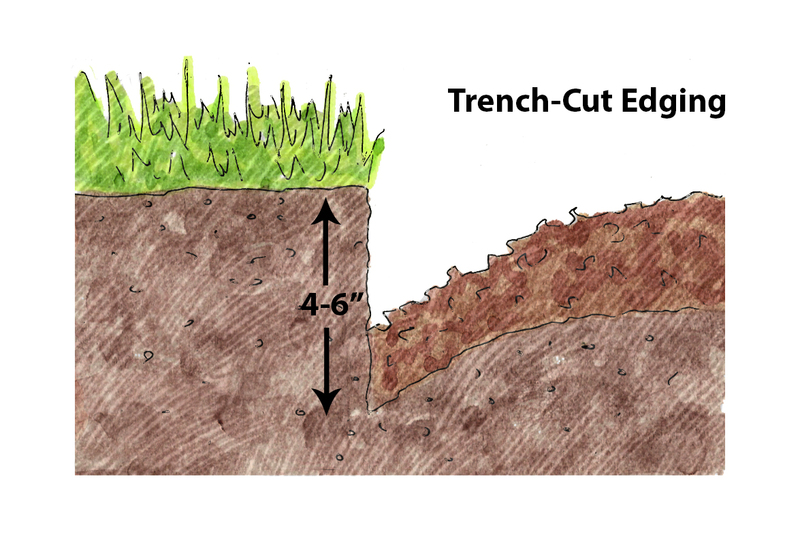 A trenched edge provides a physical break between the garden bed and lawn, leaving behind a clean edge that is easily maintained through mowing and trimming. Establish bed lines by setting WORX 2-in-1 to trencher mode and cutting a smooth line along the edge of your garden bed. Remove any turf left inside the bed line and use a spade as needed to deepen edged cuts to around four inches. Rake garden soil so that it slopes up and away from the cut edge, leaving behind a checkmark-shaped trench as illustrated below. Maintain trenched edges with the 20V GT Revolution Trimmer/Edger/Mini-Mower. Start by trimming any uncut grass even to the mowing height, then transition the GT Revolution into edger mode to sharpen corners. Run the GT Revolution Edger along the bed line, following the edge as close as possible while removing just an eight-inch or so of grass to maintain a clean line. Use the 2-in-1 Lawn Edger and Trencherto reinforce edges as needed throughout the season and annually each spring. Take care not to remove too much plant material when trimming trenched edges or you will find your planting beds gradually widen over time. The same is true when edging along sidewalks and driveways. The 2-in-1 Lawn Edger and Trencher gives sidewalks and driveways the crisp, finished look of a professional lawn care service without the high price tag. Edging also protects hardscape surfaces from intruding grass and weeds, which can cause tripping hazards and decrease the life of hardscape materials. A built-in edge guidehelps you find and follow the line of surfaces with greater control and accuracy. Align the guide so that it rests against the edge of the paved surface with the wheels sitting on the paved surface. Work slowly when running the edger, especially for the first cut of the season. If you hear the edger slow down, back up an inch or two, then resume moving forward at a steady pace. The initial edging may take some time, but follow-up maintenance can be completed more rapidly. Use the 20V GT Revolution Trimmer on weeks you do not run the edger to keep grass clipped along paved surfaces. Blow trimmings back into the grass using one of WORX Cordless Leaf Blowers to return nutrients to the soil and nourish the lawn. Find tools to help you maintain your edges by clicking HERE. Edging and trimming beds provide the finishing touch after mowing, emphasizing bed lines and creating a well-manicured look.